This evening, after work, on my drive home I told myself that I was going to walk through my doors and get changed for the gym. 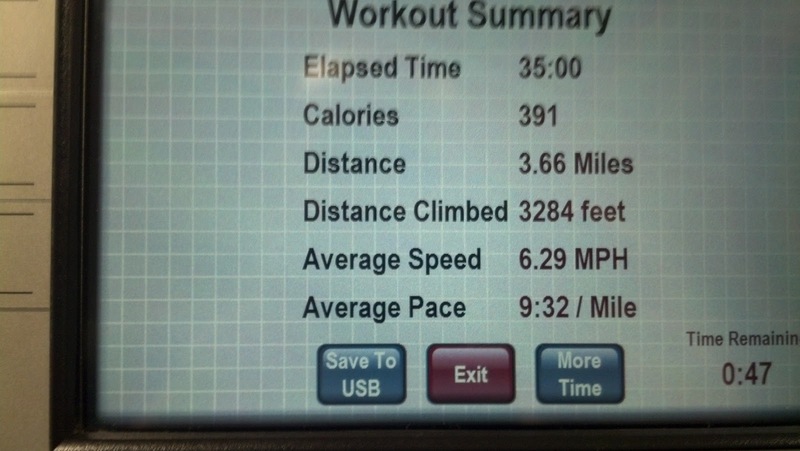 Hit up the gym and while I did not log the hour that I would have liked I still managed to go 35 minutes. After being at work all day I was just too tired and didn't have the motivation to push through for a full hour but I wanted to make sure that I went for a minimum of 30 minutes and 3 miles. These are going to be my absolute minimums from now on. 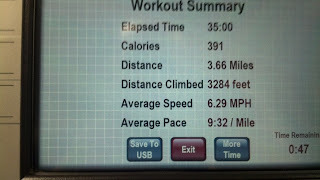 I'm hoping to up that to 4 miles by the middle of next month. There are a few days left in the month but I'm already looking ahead. Now that I've spent the month trying to get into the gym habit I'm going to set myself some goals for May as far as exercise is concerned. I will continue to post my post workout pictures as proof of whether or not I'm actually achieving what I want to or not and let the domino's fall where they may. This morning I decided to pretty much just replicate last night. Went for another 35 minutes but I upped the "level" which I guess is just code for tension but still managed to keep about the same pace/distance/calories.